Anderson Hill Farms will be offering another internet sale of high quality Belted Galloway Breeding Cattle in October 2016. 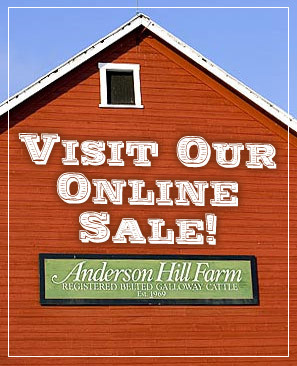 A few years ago, Anderson Hill held a very successful online auction and we are ready to make this an annual event. The inital sale of the annual event will be held in October. More information will be placed on our website in September. Young Herd Sires. Three potential herd sires will be offered. These bulls are front pasture, functional sires that should fit a multitude of operations. Look for more information on the bulls starting in September. Bred 2-year old Heifers. Cut from the heart of the replacement female pen is a great cow base of bred females. A total of five Blacks and Dunns will be represented in this segment of the sale offering. More information will be provided including the pedigrees females and the sires of the calves inside. Show Prospects and Replacement Heifers. Two square built feminine desgined black heifers are in the offering. Both heifers are born in April, are halter broke, and will be ready to be a great addition to any show string. Look for the videos of the heifers and all of the lots in September. We are excited to offer the elite breeding pieces to the Beltie world and would be happy to talk about the sale lots. Please feel free to contact us at anytime and stay tuned for more sale information as it becomes available.